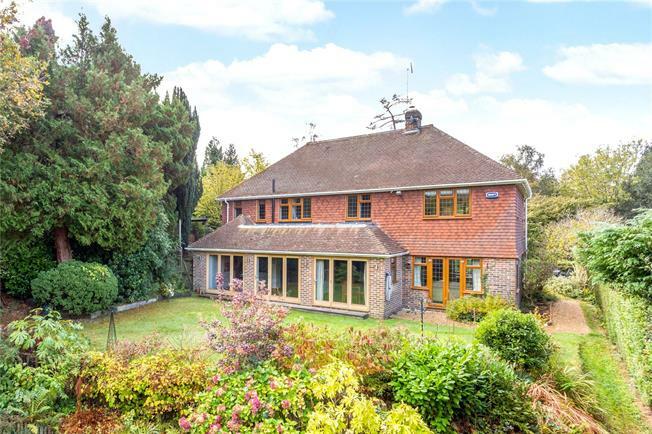 4 Bedroom Detached House For Sale in Tunbridge Wells for Asking Price £1,145,000. - An inviting entrance hall with parquet flooring, doors to the reception rooms, cloakroom and stairs to the first floor all create an excellent first impression. - The bespoke Harvey Jones kitchen/breakfast room is well fitted and equipped with an extensive range of cupboards and drawers, a central island unit with further cupboards underneath, a good range of integrated appliances, bi-folding doors opening directly to the garden, double doors to the dining room and door to the adjacent utility room. - The triple aspect sitting room has windows to the front and side, a feature open fireplace and French doors opening to the garden. - On the first floor the superb principal bedroom looks out to the front and rear and has an en suite shower room. There are three further bedrooms, one currently used as a study and all are very well served by a well fitted family bathroom. Manor Park is a prestigious private no-through road located close to the Spa Hotel, less than a mile from the centre of Tunbridge Wells and is adjacent to the golf course. Tunbridge Wells offers a comprehensive range of shops within the Royal Victoria Centre along with individual shops and boutiques in the old High Street and The Pantiles. The town is renowned for its educational facilities including the three grammar schools with schools for boys and girls of all ages in close proximity. To the front of the house the driveway provides parking for a number of vehicles and leads to a small store. There is a lawned area to the front which is screened by laurel hedging and a decked terrace which provides a lovely spot in which to entertain. The rear garden is mainly laid to lawn with a selection of mature plants, shrubs and trees with established hedging either side which provides a good deal of seclusion. There are also raised beds for vegetables and soft fruits, a summerhouse and shed. In all about 0.24 Acres.